Trying to keep cuts, sores, and abrasions clean can be both a difficult and worrisome task. 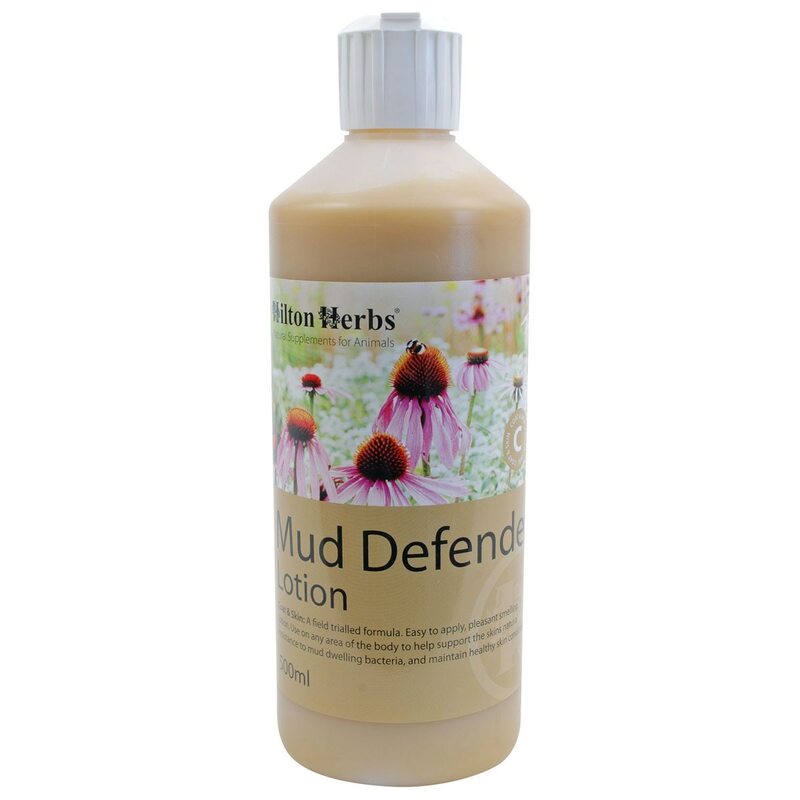 Look no further than Mud Defender Lotion to support an natural resistance to mud dwelling bacteria. This gentle and soothing lotion can be applied to all wounds, and offers both antibacterial and antifungal properties. Rich in Aloe Vera, Coconut Oil, Echinacea tincture, and Propolis, this lotion also helps to soften scabs and supports both skin and hair regeneration. May be used in conjunction with the Mud Defender Supplement. Use at the first sign of sore, damaged skin. Lightly brush off mud if dried, or wash area with cold water and gently pat dry. Apply to clean dry skin working well in and leaving a thin film of lotion on top of the skin. If skin is scabbed, apply the lotion over the top of the scabs and work well in. When the scabs soften try to gently remove them and apply more lotion. The lotion should be applied to clean dry legs prior to turnout or stabling. N.B Mud Defender Lotion is safe to apply to broken, sore, scabbed skin and should not sting when applied. The lotion is not designed to be used as a barrier cream, but does contain oils that should help deter water penetration. As with any new product, we advise patch testing prior to general use if your horse has a sensitive skin. Mud Defender Lotion is rated 5.0 out of 5 by 3. Rated 5 out of 5 by Junior from Results matter I received a sample bottle at a horse show in Florida. When I saw the results I purchased the full size bottle. It is expensive, but it really works, it is easy to apply and the horses like it. I have managed horses for almost 60 years and will not be without this product, ever. Rated 5 out of 5 by charlene from It Works! Here in washington it's muddy. Nothing seemed to be working.. Until I tried this! It's expensive.. but worth it! A little goes a long way.. Rated 5 out of 5 by WindSnick from Cleared scratches I've tried all sorts of creams, lotions, etc. and finally settled on Mud Defender. It cleared a case of scratches in a few days. Not oily. My horse loves to get the massage with application and tilts her hoof back so I can easily appy it!